So much fun for Esha Gupta with pooches! Beautiful Esha Gupta made her Bollywood debut with Mahesh Bhatt’s Jannat 2 opposite Emraan Hashmi in the lead role and won million of hearts with her sweet girl look and for some she is Indian Angelina Jolie. She loves to spend time with her family and most importantly her pet. Here Dogs & Pups chats with her to explore her PUPPY love for pooches. Esha started her career as a model, and came third in the Femina Miss India in 2007 and went to compete in the Miss India International contest. Esha appeared in Kingfisher Swimsuit Calendar in 2010. In 2012, she was signed by Mahesh Bhatt for a three-film contract with Vishesh Films and made her screen debut in Kunal Deshmukh’s Jannat 2 which was commercially successful, and followed it with Vikram Bhatt’s Raaz 3D and Prakash Jha’s Chakravyuh. She was born in Delhi. Her father is a retired air-force officer and her mother is a homemaker. She was studying Mass Communication from Manipal Institute of Communication prior to auditioning for Femina Miss India, and got a law scholarship at Newcastle University, but she pursued a career in Bollywood instead. Don’t feed them human food. And give them enough love. They will love you forever! They wake me up when they are up! • Qualities you love Everything. They know how to get their way around; they are too smart and cute. http://www.dogsandpupsmagazine.com/wp-content/uploads/2015/07/Untitled-201.jpg 180 276 Dogs and pups Magazine http://www.dogsandpupsmagazine.com/wp-content/uploads/2017/05/1254nal.jpg Dogs and pups Magazine2015-07-14 17:32:122015-07-14 17:33:50So much fun for Esha Gupta with pooches! A Newfound love called ‘DEXTER’ for Gurmeet & Debina! Gurmeet Choudhary & Debina Bonnerjee won accolades, when they played Ram & Sita in the 2008 television series Ramayan. After that they appeared together in a number of reality shows. They fell in love and got married. It’s only love all around and to add more, they brought a bundle of joy on the very first day they moved to their new home in Mumbai. In conversation with Dogs & Pups, the actor couple shares their mutual love for DEXTER—a brindle Boxer! Gurmeet Choudhary is an Indian television actor, model and dancer, who played lead roles in several TV shows and also participated in dance reality shows like Jhalak Dikhhla Jaa (Season 5), Nach Baliye 6 and Fear Factor: Khatron Ke Khiladi (Season 5). He was also seen in Bollywood film Khamoshiyan. While, Debina Bonnerjee is an Indian TV actress, her first television role was in a Tamil TV series called Mayavi (2005). Her other roles include Mayuri Narayan in Chidiya Ghar. Both share their life with their pet dog Dexter. For Debina, it was a long tale of fun, adventure, emotions and love, when she was asked to share her pooch love. “I love dogs more than anything, it all started as a kid, when one of our neighbours went on a vacation and left their pet dog with us. He was a big dog Brownie – an Alsatian and I was not at all scared of him. But when they returned to take him back, I was furious, not at all ready to give him back as he became my best buddy. But he had to go….and immediately after that I started feeling alone without a dog and used to go to bus stands and parks to play with pariahs. My mom was not at all happy with this. It was a crazy childhood…roaming in the streets to play with puppies, when most of my friends were playing in parks and gardens,” she shares. “My mom was upset as I was always playing with puppies and even started bringing them home. So, when we shifted to a bigger home in Kolkata, we got our first pet – Alpha, a Boxer. I was on cloud nine. But as I was too young, just 10 years old, so I could not take care of him and my mom decided to give him away after six months. It just broke my heart. It was an emotional moment for me, I sat next to him and promised him “Alpha, don’t worry, when I grow up, we would be together in my own home and have lots of fun,” she shares with a heavy heart. Funny/crazy antics. He tries to lay his bed down to sleep and even sleeps on the other side of the bed, if I forgot to arrange bedding for him. http://www.dogsandpupsmagazine.com/wp-content/uploads/2015/05/Untitled-82.jpg 247 378 Dogs and pups Magazine http://www.dogsandpupsmagazine.com/wp-content/uploads/2017/05/1254nal.jpg Dogs and pups Magazine2015-05-19 12:42:342015-05-19 12:45:21A Newfound love called 'DEXTER' for Gurmeet & Debina! Dogs and Keith are inseparable…they just enjoy being together… we have seen a bit of this wonderful man-canine relationship on television show ‘Heavy Petting’. So, it won’t surprise our readers, if we share that he is a big time animal lover and is a comrade of real life furry friends too! Dogs & Pups discovers this furry bond in a tête-à-tête with Keith Sequeira. 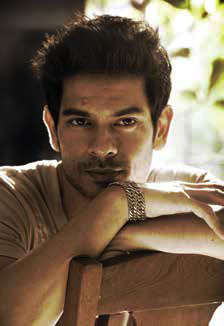 Keith Sequeira, a known face on television, often seen petting dogs, made his big screen debut with the film Sixteen as a main lead. His famous stint was as VJ with B4U music channel. Post which he became a lifestyle presenter and did shows for other premium channels like AXN, NDTV Good Times, Star Plus, VH 1. Later, he shifted his focus to sports and was a presenter with NEO Sports and Star Sports. He has also featured in popular commercial ads for Raymond, Femina, Dabur Honey, Maruti Wagon R, Timex, etc. Well begin is half done! “Bingo, a black cross bred played with me when I was young. We dropped a bottle of milk on the floor while playing and so we both hid under the bed to avoid getting caught by mom and dad. Each time someone would come to get me out, he would growl and come closer, so no one would touch me…we lay there ‘hiding’ for almost three hours,” he chuckled. As per Keith it is very important to know your pet and understand their temperament, that’s how they communicate. “Also make sure to give them plenty of exercise. Never over-feed your pet and also groom them well…that’s like getting fresh clothes every day. Talk to them, they understand more than you think,” he concluded. and when I’m at home, I spend most of the day with them. Also they remind me of special moments in my life. What your dogs love most about you: I play a lot with them. Your pet’s favourite dishes: Chicken soup with carrots. Annoying habits: Licking my face when I’m asleep in the morning. Funny/Crazy antics: When they are upset, they need to be hand-fed and pampered. World for all – STARS on Awareness & Adoption of STRAYS! World For All has revolutionised the adoption of stray dogs and cats from Mumbai streets and it runs an active population-control campaign, provides SOS treatment and conducts awareness drives. A brief. Established on 17th January 2010, World For All was started by Ruchi Nadkarni and Taronish Bulsara, enterprising college students with the cause of animal welfare close to their hearts. “It all started with a single puppy called Angel who went through a leg amputation surgery and had to be released after post-op. Because the puppy was a handicapped orphan, leaving her back on the street didn’t seem like an option. At the time, Facebook was fairly new and a FB group was created for Angel’s adoption. The pup eventually did get adopted and surprisingly a number of people were interested in adopting Indian breeds. Our personal finances were also not permitting us to do animal welfare on the required scale and hence we decided to create an organisation for animal welfare with our main forte being animal adoption,” shares Ruchi. “Running an organisation on the lines of social entrepreneurship has been extremely challenging on a day-to-day basis. Nevertheless, while we started off as two young individuals with very little work experience, today World For All runs a functional office, adoption programme, feline post-op centre and three ambulances which take care of animals in distress,” adds Taronish. “At World For All, every animal who gets adopted, and every life that gets saved is an achievement in itself. It is very rewarding and fulfilling to see an animal who otherwise would not have made it, healthy and happily homed. This in itself keeps us going and encourages us to continue serving these animals. We are extremely passionate about our cause and enjoy doing what we do,” shares Ruchi. “We do understand that not every individual would feel as compassionately about our four-legged friends. However, they have as much right to life as any of us and hence should not be discriminated or treated badly. It requires basic humanity to call in and report an animal in danger. If you can’t help a needy street animal then the least one could do is arrange help for it and if you cannot help then do not harm it,” concludes Taronish. Shot by celebrity portrait and fashion photographer Sahil Mane. Theme: ‘Every star has a reason for why a stray’. Stars portrayed – Arunoday Singh, Dino Morea, Imran Khan, Isha Koppikar, Kalki Koechlin, Kunal Khemu, Mandira Bedi, Sarah-Jane Dias, Shreyas Talpade, Siddhanth Kapoor and Erika Packard, Soha Ali Khan and Vivek Oberoi. Stars call attention to only 12 of the many reasons why Indian-breed animals are just awesome! Priced Rs 400 each, for both the wall and table versions. 6000+ successful adoptions of pups and kittens. 90 percent adoptions of Indian breeds. Largest annual adoption event, Adoptathon, gets 100+ animals adopted over a weekend. Ambulance service takes care of street animals in distress. Approximately 10-15 animals treated on a daily basis. Spays/neuters 45 dogs and 60 cats every month. Other projects – Meow Mumbai, 100 Happy Meals, Mini Adoption Camps, Animal Know it All Conference, Fundraiser events, Awareness marches, etc. http://www.dogsandpupsmagazine.com/wp-content/uploads/2015/01/Untitled-221.jpg 174 267 Dogs and pups Magazine http://www.dogsandpupsmagazine.com/wp-content/uploads/2017/05/1254nal.jpg Dogs and pups Magazine2015-01-22 17:28:502015-01-22 17:29:46World for all – STARS on Awareness & Adoption of STRAYS! World For All’s stunning #WhyAStray Calendar 2015 by Sahil Mane has 12 big Bollywood stars in support of stray animals. A must-have for all animal lovers this New Year! Ruchi Nadkarni, Soha Ali Khan, Kunal Khemu, Sahil Mane, Tara* Kaushal have fun behind the scenes. celebrities like John Abraham, Nimrat Kaur and Bruna Abdullah, this year has each celebrity’s reason for #WhyAStray, as closely related to their public personas as possible. And kudos to the lovely animal-stars who’ve come out in support of the #WhyAStray cause: Vivek Oberoi, Imran Khan, Kalki Koechlin, Dino Morea, Kunal Khemu, Mandira Bedi, Arunoday Singh, Siddhanth Kapoor-Erika Packard, Shreyas Talpade, Soha Ali Khan… does it get any bigger than this? Dogs & Pups too shows its support for the cause, and brings you some exclusive pictures from the calendar and the excitement behind the scenes! While the star-studded launch of the calendar is at The Leela on the 27th of November, you can pre-order the calendar now at worldforall.co/store. No two stray animals are alike, unlike those bred for uniform looks and characteristics. This makes each one of them unique and distinctive. They come in all shapes and sizes, in a whole range of colours, hair lengths, and, of course, personality types. The stray animals on our streets are as uniquely Indian and ‘sons of the soil’ as they get! Mandira Bedi celebrates their Indianness, as she does through her eponymous brands of sarees. She narrates a beautiful story about her first dog, who she got with husband Raj Kaushal. Buster was old and ailing when Mandira was pregnant, and she bid him farewell before leaving for the hospital for her C-section. “I was told later that he died half an hour before my son was born… I like to believe his soul is still with us and that he’s Veer, he’s my son!” she laughs. About strays, she says, “Like Narendra Modi, I am proud of our country and its heritage.” When the whole world is acknowledging the greatness of all things Indian, should our great Indian street animals be far behind? The dog at his farmhouse was a stray, and he describes their connection. “She just walked in and decided she would be part of the family. She was just incredible. ”He finds strays sharp and street smart, perceptive and communicative. “The relationship they build with you—that is pretty special.” He believes that when you rescue a stray, it is your life that fills with magic. Animals on the street have undergone the process of natural selection over thousands of generations. As a consequence, they have incredible immunity, and are generally healthy and resilient. In addition, being indigenous makes them most suited to the conditions in our country. This makes them live, on an average, longer than all breeds, greatly reducing your worry and vet bills. Arunoday Singh, who has had animals his whole life, also believes that strays sense that you’ve gone out of your way to give them a home and are grateful, making for a stronger bond with you and the home. “It’s just that there’s a lot more love,” he asserts. “It can’t be explained, you have to experience it to believe it!” he says of the “amazing thing” that is adopting a stray. Tanishaa Mukerji, an Indian actress, has recently gained a lot of fame with her stint in the popular television reality show Bigg Boss 7, where she ended up being first runner up. She considers her mother, actress Tanuja, as her lifeline whereas Kajol (multi-award-winning actress), her elder sister and her brother-in-law actor Ajay Devgan are real buddies in her life. Undoubtedly, she is the youngest and most pampered one in the family; yet she herself loves to pamper her poochie pals. Here Dogs & Pups brings tidbits about her pooch affairs! Hailing from a prominent film industry family, Tanishaa Mukerji is an Indian film actress, known for her work in several Bollywood flicks like Ssshhh…; Popcorn Khao! Mast Ho Jao; Tania; Tango Charlie; Neal N Nikki, etc. She has also been part of Marathi, Bengali, Telugu and Tamil films. Her recent appearances on TV in reality show Bigg Boss 7 kept her in news for many months. But still a few would know about her pooch love. “I have had pets all my life. I was gifted my first pet at the age of three. He was a black Pomeranian whom I named Bimbo. Over the years I have had lots and lots of dogs. I lose count thinking about them but they have given beautiful memories and some great times,” shared Tanishaa. According to Tanishaa, the unconditional love that one gets from the four-legged companion is matchless. She feels it’s the only love that makes this relationship wonderful. “My dogs love the way we play, do crazy things together. And in return I get loads of love and pampering too,” she added. She also loves to take her pets on a vacation, but only if it is comfortable for the dog. “I only take my pets to Lonavala because we have a family home there. I don’t travel on flights with them as not only is it inconvenient for me but more so because it’s uncomfortable for them. We have a great time together,” she told. Being a pet parent for long, she knows all the dos and don’ts of pet parenting. And as per her, she is a responsible pet parent, who herself takes care of all her pets’ exercise and nutrition needs. “Leo loves to gorge on chew sticks,” she shared. “When you have a dog, take care of him like a family member,” she concluded. Arunoday Singh is a well-known Bollywood hero. And when we discovered that there is just one love, which he is following since childhood we wanted to know more. So, here, Arunoday shares his story of love and compassion for pooches. Arunoday Singh was recently seen romancing Nargis Fakhri in David Dhawan’s Main Tera Hero. He debuted with Sikandar and has given some great performances in Sudhir Mishra’s Yeh Saali Zindagi and Pooja Bhatt’s Jism 2. According to him, it was after watching actor Marlon Brando in On The Waterfront that he decided to become an actor. He also shared about his constant companions, who were there with him all through his life. No price for guessing, they are his DOGS & PUPS. “Be responsible to your pet. We can have many pets in our whole life, but our pet will have just one parent for life. Get a dog only when you are prepared for it,” he concluded. Monali Thakur, an Indian playback singer and actress, rose to popularity after appearing in Indian Idol 2 top 10 contestants. Her songs for the film Race in 2008 helped carving her niche in Bollywood. Recently she won Filmfare Best Female Playback singer award for the song Sawaar Loon from the film Lootera for year 2013, which further confirmed her strong foothold in the music industry. She recently made her Bollywood debut in Nagesh Kukunoor’s Lakshmi and will also be seen in Abbas Tyrewala’s multi-starrer Mango. In her life there are only two loves…one is music and the second one, no prizes for guessing…it’s our lovely furry pals. Monali Thakur comes from a musical family; her father Shakti Thakur is a renowned Bengali singer. She was trained in Hindustani classical and started singing in school and college competitions and performing at local functions at a very young age. She received the Best Playback Singer award at the Anandalok Awards for the serial Sri Ramakrishna when she was 14. And in all her growing up years, she had one pet dog, who was there with her for 16 years. “I literally grew up with my pet dog Suzie–white Spitz. She was with me for 16 years and it took me five years to recover her absence. We were inseparable; she was my best friend and a companion for all my life. And even today, I miss her so much,” she narrated. Once a pet lover, always a pet lover…she could not keep herself deprived of pooch pal for long. It was a great emotional setback for her to lose Suzie and it took her five years to accept her absence. And today, she has a powerhouse of energy at home – Daithy – a one And a half years old Beagle who is full of starry tantrums. “Suzie and me were like nice girls…growing up together, whereas Daithy is a total brat. He is my spoiled son. He has so much of energy…woof!” she shared. Sharing more about his crazy antics, she laughed out loud for a minute, as she showed umbrella to Daithy – the super brat. “He is my cutest champ. He challenges everyone at home, and does all the things he wants to do, but the moment we will open an umbrella, he changes instantly and follows all the commands like a nice obedient chap. It’s really strange, but very funny. And whenever I am moving out of home, he will pick my things and keep it in front of him and starts giving me a look ‘If you go…I will mess up with this’ and if I try to ignore him, he will just rush to the door and sit in between my legs. After pampering him for a while and promising him a coffee and walk together, he allows me to step out of the home,” she explained. And here comes another one, “He is a city boy, who spends most of the time in peaceful atmosphere. Even when he goes out for walks, there’s not much noise within our locality. And the moment he hears auto-rickshaw noise, he gets frozen with fright,” she added. “Moreover, I take good care of his nutritional requirements as well. He loves to gorge on chicken rice, which I give him as a treat,” she added further. “Like most of the moms, I too can never be harsh to him. As he is growing up, I appointed a trainer for him, and personally see to the training,” she added. Wagging all around with Randeep! An intensely handsome actor who has begun to draw attention after his impressive performances in movies like Imtiaz Ali’s Highway, Once Upon A Time In Mumbai, Saheb Biwi Aur Gangster, Jannat 2 and Murder 3, little do people know that Randeep Hooda is not just an intense actor but an equally passionate animal lover. Interestingly, Candy (Randeep’s pariah pet) accompanies him to shooting locations…. And there’s no moment when she is not around as she’s jealous of Randeep’s female friends… especially with a handbag! Read on to unfurl this wonderful tale of poochie-pal. In addition to acting in films and theatres, Randeep regularly participates professionally in equestrian sports such as polo and show jumping. But for him the biggest relief is to be with his pets as he finds solace in animals. Besides dogs, he also has horses as pets. “I have very meaningful names of my horses and I call them Ranji, Johnny Walker, Simply Supreme, Rommel and Atillay… I can recognise them and so can they,” he said while introducing his five horses. Randeep feels it was God’s plan to gift this bundle of joy to him, “One day while waiting at airport, I saw this sweet little puppy and watched her antics for a while. My parents were with me and I told my mom that if nobody is adopting her I am taking her home. She was amazed while I picked her up and brought her home.” And today Candy and Randeep are best buddies. She rides in his jeep….travels with him to places and accompanies him to stable as well. So, how horses treat our furry angel? “They all are really best buddies and it’s strange to see Candy going gaga with these big macho players. She gets open spaces to play around and she is very good with the horses,” he added. http://www.dogsandpupsmagazine.com/wp-content/uploads/2014/03/Randeep2.jpg 280 438 Dogs and pups Magazine http://www.dogsandpupsmagazine.com/wp-content/uploads/2017/05/1254nal.jpg Dogs and pups Magazine2014-03-19 15:43:222014-03-27 10:58:00Wagging all around with Randeep!